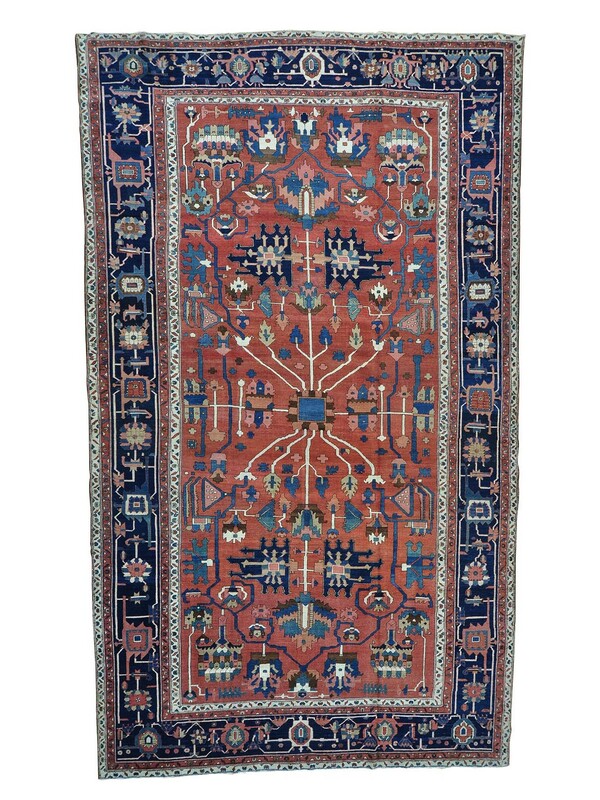 The beloved Serapi rug from the remote mountains of Northwest Persia, has a typical design from the Heriz region. 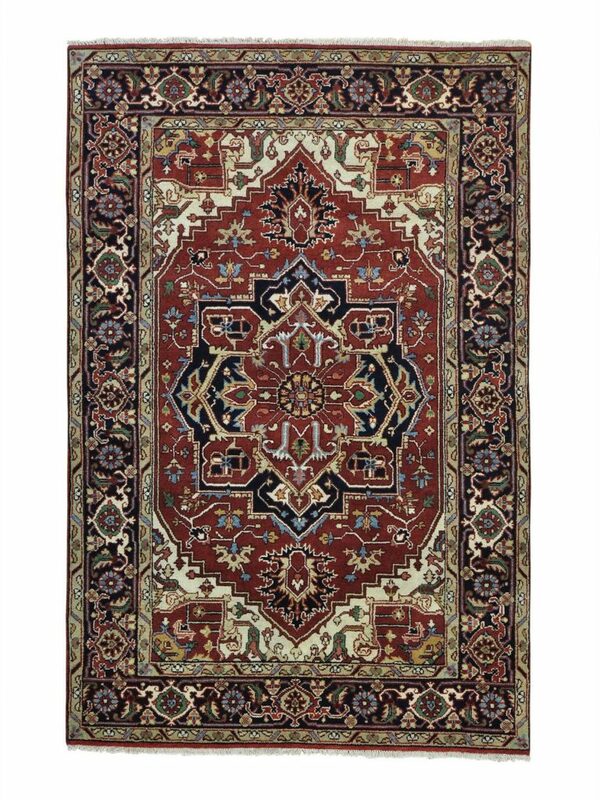 The elements inherited from many traditions are combined into the majestic antique Serapi carpet; geometric designs maybe connected to tribal Caucasians rugs, while the Tabriz carpet has surely influenced the usage of the central medallion in the Serapi rugs. The highly skilled female weavers work in groups during years, before completing a Serapi Persian rug. The spontaneity that characterizes these groups of women, is the result of amazing and tedious labor. Small workshops were known to deliver fine knotted carpets, while families created symbolic designs and a more rustic weave type. The women from the Heriz region also had knowledge of how to deep dye the local wool, achieving the desired “abrashed” or muted color. Large areas of the Heriz rug use pale wool colors, providing the perfect contrast that distinguish these carpets. 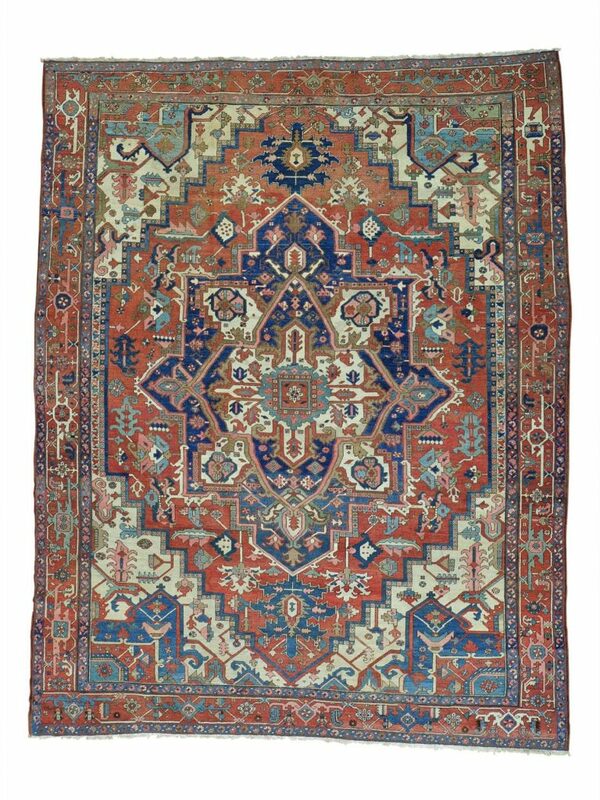 The 19th century Serapi carpets are known by a center quadrant medallion, inspired by a bird’s eye view of a persian garden. In many occasions, a large-scale all-over design pattern could also be used. Nowadays, the Serapi inspired hand-knotted rug can be found in many different colors, ranging from the traditional pink, red and navy blue. In the years 2015 to 2017, many rug designers have modified the look of The Heriz carpet, to the so called “Broken Design Rugs.” These new carpets are indeed very valuable as a new trend in the design industry and an original handmade piece can only be found from trusted rug shops. In the first years of the 20th century, these rugs were woven in isolated areas, and then sold in the market of the Sarab city of Persia. This is where the name Serapi originated, from the word “Serab-i” which means “of Serab”. The whimsical charm of the antique Serapi carpet, it’s pure vegetable dyes, traditional designs, or modern broken motifs, make them a worthwhile furniture item. Many interior designers love to have this type of rug, as a home decor idea.